This NCLEX review will discuss appendicitis. As a nursing student, you must be familiar with appendicitis, the pathophysiology, major signs and symptoms, and the nursing care for a patient experiencing this condition. Don’t forget to take the appendicitis review quiz. Where is the appendix? It is found on the right lower side of the abdomen and connects to the cecum of the large intestine. 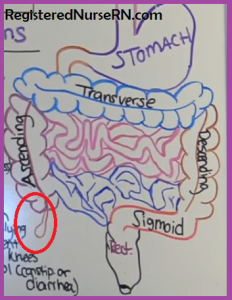 It looks like a protruding worm or finger-like structure coming out of the large intestine, specifically the ascending colon. The role of the appendix: it plays a role in storing the “good” bacteria in your GI tract while the tract is recovering from a diarrhea illness (so it helps maintain healthy GI flora). swollen lymph nodal tissue in the mucosal lining of the appendix can swell….these lymph nodes help fight viral and bacterial infections…people who have Crohn’s Disease, mononucleosis, measles, or gastroenteritis are at risk. The blockage in the lumen of the appendix causes major INCREASE PRESSURE inside the appendix. What is causing the increased pressure? Inside the appendix is mucosal lining, which is continuously secreting mucus and fluids. There are also bacteria that normally live in the appendix that start to increase in production due to the blockage. All this “material” (mucous, fluids, bacteria) continue to grow and it can NOT move anywhere due to the blockage. 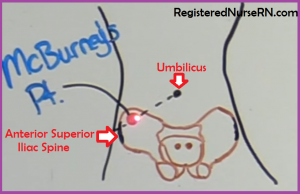 This causes major pressure in the lumen of appendix that can lead to perforation (rupture) of the appendix. Note: if appendicitis is not treated within 48-72 hours there is a risk for rupture which will lead to abscess and peritonitis. What happens as the pressure continues to build? It leads to major venous obstruction of the veins of the appendix. Therefore, there is occlusion of blood flow and the stagnant blood can’t go anywhere. What happens when blood stays stagnant? It coagulates, hence leads to the development of a clot formation. This further complicates everything and leads to ISCHEMIA. Therefore, the appendix will start to slowly die. As the appendix dies, the walls of the appendix break down and start to leak all of its contents (bacteria etc.) into the abdominal cavity. This leads to an abscess forming at the site of rupture and PERITONITIS, which is life-threatening. Treatment for appendicitis? Appendectomy which is the surgical removal of the appendix. It may be performed as an open surgery or laparoscopic. eXperiences rebound tenderness (when pressure is applied to the right lower quadrant it hurts but it HURTS MORE when the pressure is released) and abdominal rigidity on palpation (involuntary stiffening of the abdominal muscle when abdomen palpated). Maintain drain after surgery, if present. Most sites will have a drain if the patient’s appendix ruptured. The drain will drain excessive drainage due to the irrigation used to wash out the abdomen and remove the infection. Maintain the drain per MD order. It will be removed when it stops draining. To help will drainage to escape the abdomen, try to keep the patient on the right side which will allow gravity to help with drainage (don’t want drainage staying in the abdomen). Maintain NG tube if present (remove stomach fluids and swallowed air). It will be removed when bowels start to work…keep NPO until tube is removed. Diet will start out slow with clears, then fulls, and solids as tolerated. Encourage patient to eat a high fiber diet (decreases straining during bowel movements). Monitor bowel sounds (are they present? ), patient passing gas?, and when last bowel movement was (should have a BM within 2-3 days after surgery…if not notify doctor). Surgery may be open or laparoscopic….If done laparoscopic: patient may experience shoulder pain for a couple of days after surgery. It is due to the gas, “carbon dioxide”, used to expand the abdominal wall away from the internal organ so the surgeon could see the appendix and GI tract during surgery.